Information about Pattaya Snorkel Trips & Tours. This section is for snorkelers looking for information and answers when choosing to snorkel Pattaya. Please contact us if you have any other questions or require further assistance. How to Book a Snorkel Trip? Fill in the simple Book and Pay online or contact us and pay deposit in store before trip. Online payments are made in full before 9pm (Local BKK Time) the night before the trip scheduled. For in store deposit or payments, Please Allow 24 hours advance to guarantee your booking and we require minimum ฿500 deposit per person. Is it Safe To Snorkel In Pattaya? Yes! Our Pattaya snorkel tours are focused upon safety. From the standards of Our Snorkel boats and staff to the training and guidance we use to make sure you have a relaxing, stress free fun day on the boat enjoying a float around with the Pattaya sea life and Pattaya Corals. Our Services offer top value for money combined with a professional excursions service. Our snorkel Pattaya trips are safer and we think, more fun and relaxing than most other water sports around the Pattaya islands. Our professional snorkeler guides are on board. They are ready to help and assist and are also local marine life experts. The expert advice you will get will help you find the best snorkeling spots and stay clear away from any potential hazards such as strong current, jet skis, and speed boat areas. Nearly every day someone asks the question: What’s the differences between snorkeling and scuba diving? Simply put, less training is required for snorkeling but you are constantly supervised for scuba activities. Swimming proficiency is not required but you should at least be comfortable in water to enjoy the experience of snorkeling or scuba diving safely. Snorkeling is swimming on the surface of the water using a snorkeler set of mask, fins, and snorkel. The enjoyment come from looking down with your face in the water and floating around the reef looking at the underwater world below. It is meant to be a relaxing and non-exertive experience. Scuba divers use a little more equipment, including a compressed air cylinder worn on their back to breath from underwater. PADI is the ‘Professional Association of Diving Instructors’ and our team includes expert scuba trainers who teach and certify students through the full range of PADI scuba courses. Can we also Try Scuba Diving in Pattaya? Most definitely! 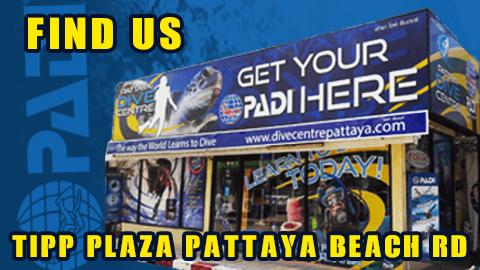 We have qualified experienced PADI Scuba Instructors in our team and they would be delighted to take you on the PADI one-day scuba diving program for beginners diving Pattaya. We also offer you a single day combination package of one (1) scuba try dive and one (1) island snorkeling tour both activities for only 2,900 ฿ per participant. What Kind of Fishes and other Pattaya Sea Life Will We See? Very Good Question! Without listing every single type of fish and coral formation that exists in the Gulf of Thailand, the most popular fish species that you should see includes Damselfish, Sergeant Major fish, Butterfly fish, Angelfish, Stingrays, and Sea Turtles. You can Read about the Pattaya Sea Life here. What Time does the Snorkel Trip begin and the Boat Depart and Return? We usually meet up around 8:00am and the boat usually leaves Pattaya around 09.00 a.m. Some of our snorkel trip visit other Pattaya snorkel areas like Samae San which may mean our pickup times start an hour earlier. The return times vary according to the snorkeling and diving activities and the weather conditions but the usual time is around 16.00. If you are traveling from Bangkok to Pattaya to join the snorkeling trip, please allow at least two to three hours car journey as the Bangkok traffic can be unpredictable. What Food is Available on the Boat? We serve a mixture of Thai and western lunches on board usually around mid-day. We provide you with hot food and some soft drinks free of charge during the day. We have never had a serious complaint about the food that we offer on the boat and most of our snorkelers comment on the high quality and quantity available all day. Usually there will be rice, soup, chicken, and fruit. Tea, coffee and drinking water are available on the boat all day for free but the Captain will charge for beer and certain soda drinks. Very often asked to arrange vegetarian meals for our snorkelers to which we are happy in offering this service if we are notified in advance so we may prepare it. Can I Buy a Personal Snorkel Set? Although Our Snorkeling Equipment provided is cleaned and keeped to the highest standards, many people prefer to have their own, be it for hygine reasons or just personal comfort. We recommend buying your own snorkeling gear for many of the same reasons. We stock quality snorkel equipment and sets which can be found on special offer each month! Ask about or snorkeling kits and equipment for sale from 999 Thai baht. Can a Non-swimmer Go Snorkeling? Absolutely Yes! We welcome non-swimmers who enjoy being on the boat for a day at sea. Not all of our snorkelers are proficient swimmers and we can offer more intensive supervision and provide life jacket flotation for them. You do not need to be able to swim, just be able to trust in us and relax. Snorkeling does not typically have age limitation like some other water sports and even if you are not a strong swimmer you can still enjoy the therapeutic benefits of a lazy day in the sun floating on the warm tropical waters of the Siam Gulf. When you are ready to enter the water we fit you up in a safety flotation jacket providing you with extra buoyancy to make you float. The advantage of wearing a life jacket, whether you can swim or not, is you will float, which should normally prevent you from descending underwater. What is the Water Temperature in The Ocean? The average water temperature around the Pattaya Islands is 30 degrees Celsius and even in the ‘winter’ the water is very unlikely to drop below 27 Celsius. We have witnessed a ‘balmy’ 33°C during the hot and humid season around May to August. Are there Strong Ocean Currents? Which are the Best and Worst Months for Snorkeling around Pattaya? Pattaya snorkelings best months are from November until April. These winter months tend to be very dry and sunny but quite windy. The rainy months usually start around June and gradually get wetter each month until October when the worst of the monsoon rains usually arrive. Where to Find Bali Hai Pier Pattaya? Laem Bali Hai Harbour or Bali Hai Pier as it is known are located at the south end of Walking Street. Because this area gets busy with tour buses Snorkel Pattaya have arranged to depart from Pattaya Beach Right outside out dive center avoiding this busy tourist area where most of the speed boats, fishing vessels, and private charters depart from. Upon occasion it not possible for us to depart from the beach, be it due to weather restrictions or other logistics in which case you will head to Bali Hai early to depart before the masses arrive. What is your Policy for Cancelations and Refunds? We kindly expect any cancelations on your behalf to be confirmed at least 24hrs before departure. If we must cancel a snorkel trip because of bad weather conditions or if we cancel the tour for any other reason we issue a full refund (including any deposits made). However, deposits are usually non-refundable for bookings made that result in a “no-show” by you.